Listen to your favorite MIDI tunes on your MP3 player or use MIDI tunes as ringtones on your mobile phone! Rapid MIDI to MP3 Converter can turn a bunch of .MIDI files into high-quality AC3, MP3, FLAC or a dozen other formats in a matter of seconds. MIDI files are files that end with the extension .mid or .midi. These are described as digital or electronic sheet music. Computers can read MIDI files much like the player pianos of yore could read the instructions on a punched paper roll in order to “play” a song. MIDI is a protocol not sounds. It defines how electronic musical instruments, computers and other related devices can communicate with each other. MIDI files are simply a way of saving a stream of MIDI data to disk so that it can be played back later. The MID file format was developed to transfer data in between applications for musicians and audio developers, allowing them to play multiple files from a single controller. The files contain specifications for various parameters like notation, pitch, velocity, and control signals. All of these help in tempo control for multiple devices. The MID file format offers compactness, ease of modification, and choice of instrument. The Standard MID file format contains two variations, Type 0 and Type 1. Type 0 is single track data while Type 1 is multi-track data. A MID link can carry sixteen independent channels of information numbered from 1-16. MID messages are made up of 8-bit words (bytes) that are transmitted serially at 31.25 kbaud. The messages may be device specific, for example in case of channel messages which can be heard on devices receiving on that channel only. MIDI files are very small and extremely useful for creating music. However, if you want to represent the composition as a completed work, MIDI files have to be converted to some audio format, like WAV or MP3. The reason is simple: MIDI files aren’t supported by most hardware players, and those players that do support such files play them differently. You can get very unexpected results when trying to play your MIDI files on a new device. Rapid MIDI to MP3 Converter solves this problem. Using it, you can easily and quickly convert your MIDI composition to a high quality WAV or MP3 file. Such files don’t need expensive synthesizers to sound good and can be used with MP3 players. You will also need such files if you want to burn MIDI files as an Audio CD. 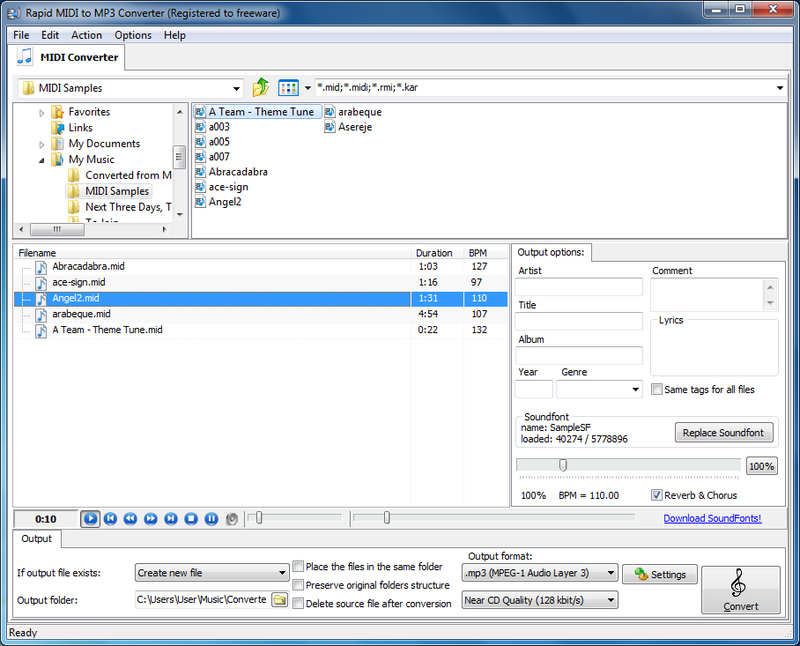 Rapid MIDI to MP3 Converter uses SoundFonts to create high quality sound (SoundFonts are sets of recorded samples for certain musical instruments). Thus you can easily select a SoundFont that produces the best sound for your MIDI composition. There are many free and paid SoundFonts available for download on the Internet. MIDI to MP3 Converter comes with a preinstalled SoundFont, but you can download and use any other SoundFont package instead. The MPEG-1 Audio Layer 3 (MP3) format is a lossy audio format. That means that an MP3 file does not contain 100% of the source audio information. Instead, MP3 files use perceptual coding. In other words, that means it removes the information that your ear doesn’t notice thereby making the file smaller. The reason lossy formats are used over RAW is that RAW audio files are too large to travel over the internet at any great speed. By using lossy formats it enables even dial up users to download mp3 files at a reasonable speed. RAW file formats generally require 176,000 bytes per second compared to a lossy format which requires 17,600. The difference is massive and so are the download times. In fact, the conversion quality provided by Batch MIDI to MP3 Converter is so good it’s hard to believe you’re listening to a good old MIDI file and not to a symphony orchestra. Just listen to this sample to check out how great the conversion can be done! What’s the native format of your audio player? Is it AAC, AC3, MP3 or WAV? No problem! 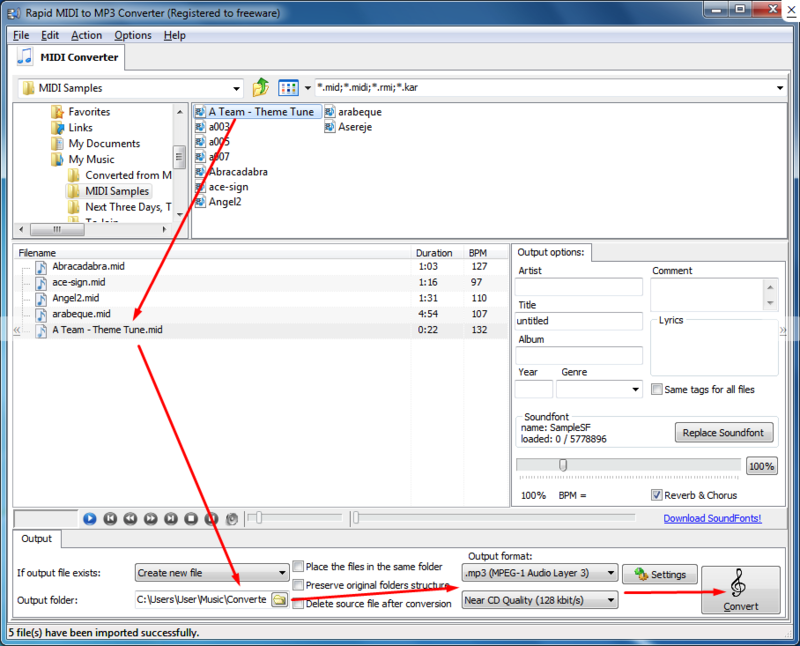 Batch MIDI to MP3 Converter can quickly convert your MIDI files into any popular audio format. Supporting all types of MIDI files, MIDI to MP3 Converter can convert RMI, KAR and MIDI files to any supported audio format in just a few seconds. To enjoy your MIDI compositions, you don’t even have to convert them. The built-in audio player allows listening to MIDI files with all the sound fonts and special effects already applied in real time – no conversion required! It’s just the best Midi To MP3 Converter. Rapid MIDI to MP3 Converter comes with fully-featured batch mode, allowing converting entire folders full of MIDI files into the format of your choice. You can opt to use a lossless codec to get the ultimate audio quality, or select MP3, AAC, WMA, WAV, AC3 or OGG if you need the files in your phone or audio player. Output: .MP3, .WMA, .AAC, .WAV, .M4A, .ALAC, .AC3, .FLAC, .MP4, .OGG etc. Free download online and install Midi To MP3 Converter on your Windows, and then follow the step by step guide to convert midi to mp3 within minutes. Here we take convert MIDI as example. Step 1 Add .MIDI files you want to convert to mp3 to this Midi To MP3 Converter – simply drag and drop your .MIDI files to the main interface of the program. Tips: Drag and drop the folder where the MIDI files are to Midi To MP3 Converter, if you don’t want to add files one by one. Note that these .MIDI files are arranged according to the play order. So if you need to exchange the location of few MIDI files, just free drag them to your wanted position. Step 2 Set the output format: MP3, WMA, WAV, OGG or any other. Choose another audio format as output format if you’d like to change the target format. Step 3 Customize audio parameters: click Settings button to set audio parameters (sample rate, channels, bitrate) for the output format as you want. Step 4 Convert MIDI files to MP3! Simply click big “Convert” button on the lower right corner of the program to convert .MIDI files into MP3 in a flash. Now you can play the converted audio on iPod, iPhone, Apple TV, Pocket PC, PSP, Zune, Mobile phone, VCD, SVCD, DVD devices. In this article, we show an easy way to convert the source .MIDI files into other audio formats like MP3, WAV, WMA, AAC, M4A, etc. It is really worth a shot. How do I uninstall Midi To MP3 Converter in Windows Vista / Windows 7 / Windows 8 / Windows 8.1 / Windows 10? Select “Midi To MP3 Converter” and right click, then select Uninstall/Change. How do I uninstall Midi To MP3 Converter in Windows 2000? How do I access the Midi To MP3 Converter download for PC? Will this Midi To MP3 Converter download work on Windows? MIDI to MP3 | Convert MIDI to MP3 | Free MIDI to MP3 Converter | MIDI Converter MP3 | MIDIs to MP3 | Download from MIDI to MP3 | MIDI to MP3 Online | best midi2mp3 converter | Free Download Midi to MP3 | free midi to mp3 download| Online MIDI to MP3 Converter.